This Canadian-born band is now what it probably always should have been: a 3-man band, strong on guitar, and even stronger in complexity of musical composition. Geddy Lee is their lead vocalist, also taking on bass guitar and keyboard. Alex Lifeson plays guitar and sings backup vocals. Neil Peart plays percussion and also contributes to backup singing. Rush has borrowed heavily from the realms of sci-fi, fantasy, and even philosophy during its 4-decade history, laying claim to spot #86 on the RIAA list of certified record sales, with 25 million of their albums or "units" being sold in the US alone. Total sales around the globe likely hover around the 40-million mark. They've achieved 24 gold albums, 14 platinum albums, and 3 multi-platinum albums -- feats that are as much a tribute to their constant, persistent production values, as much as to their popularity and musical appeal. 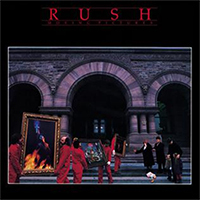 Separately, each of their members are highly acclaimed for their individual musical talents, and their work together as Rush is often noted for its exceptional production quality, a byproduct of that tremendous talent and work ethic. Though several other members have come and gone over the years (John Rutsey on drums and vocals; Jeff Jones on bass and vocals; Lindy Young on keyboards, guitar, drums, harmonica, and vocals; Joe Perna on bass; Mitchel Bossi on guitar and vocals; and Gerry Fielding on drums), here is the heart and soul of today's incarnation of Rush. Vocalist and frontman Geddy Lee has a voice that often strikes immediate and definite opinions in the listener. Some describe it as "screeching" while others prefer "wailing". Either way, Lee's voice is on the higher end of the scales (though it has deepened over time). What has never been the subject of critical scorn is his guitar playing abilities. His technique is nothing short of extraordinary, and his playing has inspired many other iconic guitar players of this age -- Iron Maiden's Steve Harris and Metallica's Cliff Burton, just to name a couple. But perhaps even more impressive is his ability to play multiple instruments at the same time. He does this frequently during live performances, refusing to have other musicians step in for what he's laid down on the album. He often sings, plays bass guitar, operates keyboards, and utilizes foot petals -- all simultaneously. Lead guitarist Alex Lifeson is also highly acclaimed for his technical abilities, most specifically, his unique riffs, use of electronic effects, unusual chord structures, and amazing array of equipment. Borrowing from greats like Jimi Hendrix, Eric Clapton, and Jeff Beck, Lifeson's playing sometimes displays inspiration from both classical music and Spanish tunes. These unique touches made Rush's sound stand out significantly during the 70's. During the 80's, Rush's music leaned more heavily on Lee's keyboards, but by the 90's, his unique style was back front and center. Percussionist Neil Peart is widely acclaimed as one of the best drummers around. He was one of the first to begin drum solos during live concerts (Keith Moon was actually the very first), and Peart learned a lot from the legendary drummers of the 60's and 70's, especially John Bonham, Ginger Baker, and Carmine Appice. He also was one of the first to incorporate non-drum instruments into his percussion performances, including glockenspiels, tubular bells, and unusual drum set configurations. Peart often came onstage to drum sets with more than 50 percussion instruments assembled. During the 90's, Peart spent some time working with drum coach Freddie Gruber, and somewhat refined his style. Nevertheless, the raw talent and tremendous attention to technical detail remains -- still defining his musical contributions. Another thing that makes Peart so different from most band drummers is that he writes the lion's share of Rush's lyrics. His writing style is often described as eclectic, covering topics rarely seen outside of literature. Sometimes deeply thoughtful, other times persuasive, and even preachy, he delves into subjects like science fiction, fantasy, and humanitarian issues. Allmusic named Peart "one of rock's most accomplished lyricists," for his innovative writing style. This doesn't always garner Peart acclaim, however. He was named among the "40 Worst Lyricists in Rock" by Blender magazine. Though eligible as early as 1998, Rush did not receive their induction into the Rock and Roll Hall of Fame until 2012. Some say it was a deliberate snub; others point to what has often seemed like an overall trend by the Hall of Fame to exclude bands and performers of progressive rock. They have also received a star on the Hollywood Walk of Fame, in 2010, along with numerous other awards, both for the band and for Rush's individual members. Rush announced plans to cease large-scale touring at the end of 2015, much to the fans' chagrin. However, the band remains intact and there is still hope for some future production. The last public offering came in the form of their latest documentary, Time Stand Still.